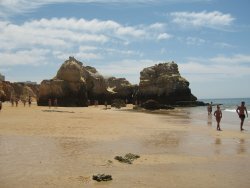 This lovely beach was virtually deserted when we visited in sunny weather during March. It is a great location with some small beachfront cafes. for lunch at the beach cafe the atlantic salmon fresh and delicious with local white wine .with olives and bread. a view of the ocean and a great surfing beach . Just a beautiful, wild beach, with rollers coming in from the Atlantic. Beautiful sands and local cafes to add to the ambiance. chilled, great waves, beatuftil view from up on the hill and super nice surf shop very laid back. surfed, slept, smiled, laughed, never wanted to leave. there's not many places to eat so picnic recommended. Beautiful unspoilt spot with beach side restaurants and amenities the scenery and ambience enchanted the whole family ages from 7 to 84. Kids loved it, dad loved it! Great body boarding. 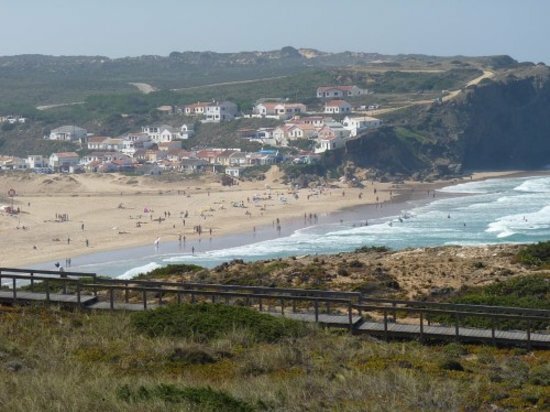 Take a drive up the hill for great views of Praia da amoreira. 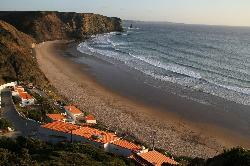 Very good beach for surfing. Not so much places to park your car, though. Nice views over the traditional fishing village. 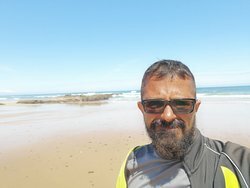 I love this beach. So beautiful and romantic. I watched the sunset with my boyfriend on the top of the hills. Nice clean beach . Better than Arrifana- less crowded. Nice beachrestaurants. Bring sunshade if you need. Get quick answers from Monte Clerigo Beach staff and past visitors.